New teachers often struggle to apply their knowledge in real-world settings, and the idea of mentoring these teachers during their first years in the classroom has captured the imagination of schools all over the world. Drawn from the experiences over the last twenty years of the New Teacher Center, the book illuminates the subtleties and struggles of becoming an excellent, effective mentor. 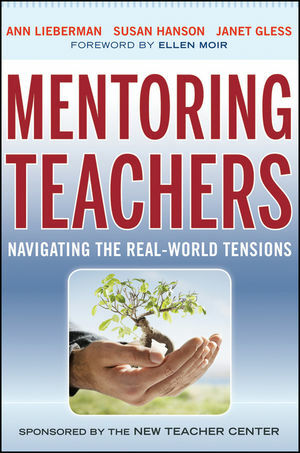 The book discusses the five big tensions of mentoring: developing a new identity, developing trusting relationships, accelerating teacher growth, mentoring in challenging contexts, and learning leadership skills. This book is from the New Teacher Center, an organization whose highly respected mentor training model has served over 50,000 teachers nationwide. The New Teacher Center is dedicated to improving student learning by accelerating the effectiveness of teachers and school leaders through comprehensive mentoring and professional development programs. Ann Lieberman is a senior scholar at Stanford University. She was a senior scholar at the Carnegie Foundation for the Advancement of Teaching, and she is an emeritus professor from Teachers College, Columbia University. Susan Hanson is a senior researcher at the New Teacher Center (NTC). Janet Gless is the chief programs and partnerships officer at NTC. New Teacher Center is dedicated to improving student learning by accelerating the effectiveness of new teachers and school leaders. NTC has served over 50,000 teachers and 7,000 mentors, touching millions of students across the country through comprehensive mentoring and professional development programs.